let's talk about this massive heat wave that is hitting the southeast USA today. Temperatures in N. Carolina have been in the mid-high 90's today, with a heat index topping 100. At one point it felt like it was 105 degrees in Charlotte this afternoon. "Forecasters say people should limit outdoor activity during the hottest portions of the day, wear lightweight clothing, drink plenty of water and be watchful for signs of heat exhaustion, which include heavy sweating, pale and clammy skin, weak pulse, fainting and vomiting." This tidbit of information was featured in the article, "Heat Wave hits North Carolina," on Reese Nation. 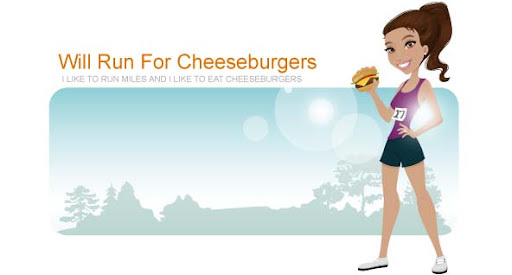 I decided to heed this warning and skip out on my usual Tuesday night run with the Charlotte Runners meetup group. Instead I headed to the YMCA with Sue to do some cardio. The treadmills were all full so I had to give up mine before I really wanted to. I was hoping to still get in 5 miles today (usually do 5.15 miles on Tuesday on the Booty Loop) but instead only ended up with a little over 4 miles. While waiting for Sue to finish I did 5 minutes on the rowing machine. 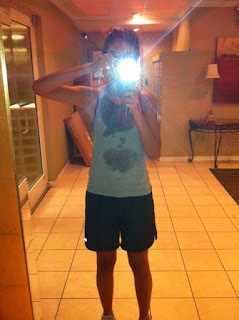 I think I was slightly embarrassing her since I was dripping with sweat from my run. I mean, that's pretty gross right? I guess I couldn't blame her. 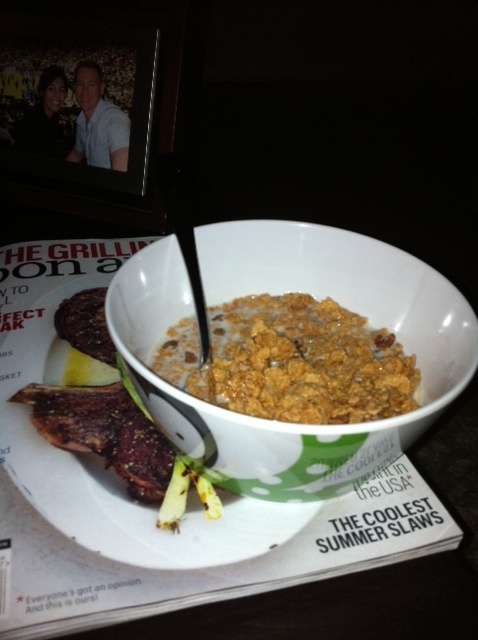 Once I had showered I treated myself to a delicious dinner ... cereal. I must admit, this was my 2nd dinner of the night. Around 5:30pm I made myself a cheese quesadilla to hold myself over until after the gym. 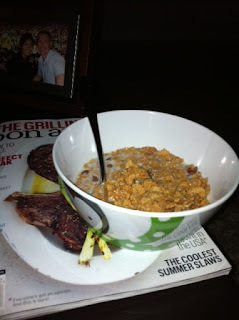 Sometimes a nice, cold bowl of cereal just hits the spot.